DataVisualization.ch offers this selection of data visualization tools that they use frequently. They include a nice note in the footer of their page that this isn’t a comprehensive list of information visualization tools, just the libraries that they prefer for their own work. 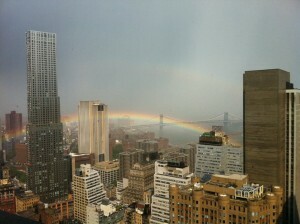 Shared with me by Andy Fisher, a photo taken by his bro from an NYC office. Back in 2009 I invited all of my friends to join me at OpenSky. We were young and enthusiastic and naive back then; in the intervening 18 months we’ve become less young and naive but more enthusiastic than ever, because we relaunched OpenSky just a couple of months ago and our growth and shopper responses have been phenomenal since then. I’m finally at a point where I’m proud of the work we’ve done and eager to give you an inside look. And if you know me then you know that’s saying a lot. Second, there’s a fair chance I owe you an email or call, a lunch, a beer, an alibi, or something else. If so, I promise that if you join OpenSky today then I’ll finally stop wasting my time wondering how to make OpenSky better and start talking to you instead. Yes, it’s sad, but I’m a man obsessed. You’re smart, empathetic, and generally good looking. I’d LOVE to hear your thoughts about OpenSky and the experience in general, so I can continue to improve it. Please leave a comment and let me know. How would you describe OpenSky to a friend? Why would you suggest they join? What other sites or services would be effective alternatives to OpenSky? Do you think you’d ever want to use OpenSky? What type of person do you think would really like OpenSky? What’s the single most important thing we could do to improve OpenSky? What curators should we add to OpenSky? Finally, I’m going to stretch my luck by asking you to please tell to your friends about this blog post and ask them to join and post their thoughts as well. A couple of weeks ago I found some old Elric paperbacks on someone’s stoop (that’s how we freecycle in BKLN – just leave your cool crap on the stoop for someone else). As an old school D&D player, I knew of Elric but hadn’t ever read Michael Moorcock’s tale of the nihilist young Melnibonean emperor who attempts to cheat fate and save the world despite his dual addictions to drugs and a demonic sword. Stumbling on Woodkid’s Iron video as I journey through tales that informed so much of my creative aesthetic feels like a gift from Arioch himself: a wicked delight, an otherworldly scheme. Today, by Jonathan Harris with Scott Thrift. Some things are pure but other things are meant to be. There’s a great thread on Quora about why Dropbox is more popular than it’s competitors. The answers are not surprising but they are a great reminder of the product design essentials. I ran into the CEO of Dropbox and asked him my burning question: “Why don’t you support multi-folder synchronization?” His answer was classic Dropbox. They built multi-folder support early on and did limited beta testing with it, but they couldn’t get the UI right. It confused people and created too many questions. It was too hard for the average consumer to setup. So it got shelved.